If your organization uses managed term sets to implement formal taxonomies, you can use the Term Store management tool to import or create the term sets. If you're a Term Store Administrator, follow these steps to open the Term Store management tool. Go to the Site Settings page for a site that you own. Under Site Administration, select Term store management. 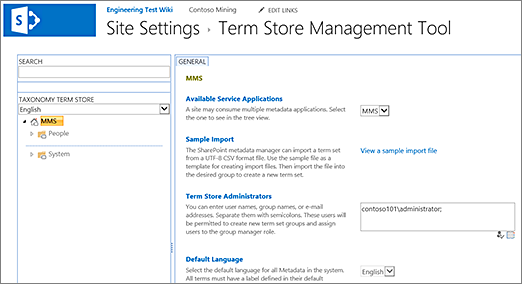 If you're a global or SharePoint admin in Office 365, you can access the Term Store management tool from the SharePoint admin center. In the left pane, select term store.